Quick and straightforward, aqueous size exclusion chromatography (SEC) has become a mainstay for the analysis of protein aggregates in the biopharmaceutical industry. Coupling SEC with advanced detection, such as mass spectrometry, light scattering or surface plasmon resonance, makes it a versatile tool for numerous applications beyond aggregate analysis. 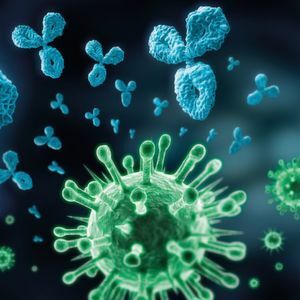 The antibody therapeutics market is enjoying high growth rates, the major areas of therapeutic application being cancer and immune/inflammation-related disorders including arthritis and multiple sclerosis. In 2017, five of the top ten best-selling global drug brands were monoclonal antibodies (mAbs) and more than 400 mAbs or mAb related drugs were in clinical trials. The characterization and monitoring of these complex biomolecules is a major challenge throughout the entire development and manufacturing process. Timelines in the analytical laboratories are increasingly tough. On the other hand, there is a strong drive to explore and understand biologics more in detail. With new biopharmaceutical formats in the pipeline — bispecific antibodies and antibody-drug conjugates, for example — rapid and thorough characterization will be even more important. In this context, the task for separation science is to increase resolution and plate numbers in shorter analysis time. Applying latest UHPLC column technology improves the quality of separation and thereby the reliability of results. The separation of mAb monomers from their aggregates is one of the standard assays at all stages of mAb development and manufacturing. Size exclusion chromatography is the method of choice for these types of analyses. UHPLC (ultra-high performance liquid chromatography) is already a standard technology in the analysis of small-molecule drugs so it is no surprise that biopharmaceutical manufacturers are now looking to follow suit. For decades, The Tosoh G3000SWXL has been the gold standard for aggregate detection in the biopharmaceutical industry. 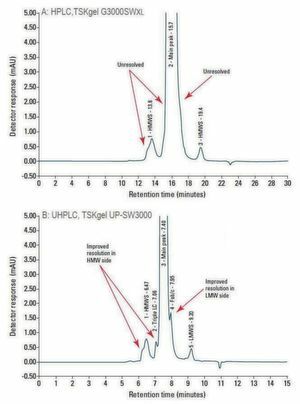 Featuring the same pore size and surface chemistry but smaller particle size, The UP-SW3000 is the UHPLC column of choice when transferring established HP-SEC methods to UHP-SEC. Figure 2 demonstrates the advantages of the the column (4.6 mm x 30 cm, 2 µm, 250 Å, flow rate 0.35 mL/min) used with a UHPLC system for mAb analysis versus the use of a TSKgel G3000SWXL column (7.8 mm x 30 cm, 5 µm, 250 Å, flow rate 0.5 mL/min) with a conventional HPLC system. It offers higher resolution of both the high molecular weight species and the fragments. In addition, the analysis was completed in half the run time. When integrating a new UHPLC column in routine analysis at big pharma, a thorough evaluation takes place. Important features besides the pure chromatographic performance are life time studies and lot-to-lot reproducibility. Both are known to be critical for many commercial UHP-SEC columns. In customer evaluations, the UP-SW3000 column performed extraordinary well. Lifetime was reported to be high, even with demanding new antibody formats, and lot-to-lot reproducibility is excellent. Coupling SEC with multi angle light scattering (MALS) detection enables absolute quantification of a molecule’s molar mass, irrespective of elution time. SEC-MALS has become a valuable tool for verifying purity of monoclonal antibodies as such or as a quick check while the downstream processing takes place. Besides fluorescence detection, light scattering is one of the most sensitive methods to detect protein aggregates.